Recording drums is complicated. But it doesn’t have to be. The key is to simplify. Utilize a “less is more” approach for surprisingly powerful results. When recording drums it’s very easy to become lost and overwhelmed in the process. With so many different parts of the kit to mic up and so many different microphones to plug in and keep track of, it’s easy to become frustrated and lose your inspiration. You want to create music and capture your ideas as fast and first-rate as possible, not get swallowed in a pit of snaky wires and technical rubbbish. The best way to win when recording drums (actually, when recording anything) is to keep it all as simple as possible. Here’s two extremely simple approaches to miking a drum kit that yield high quality results, yet minimize the amount of confusion in your creative process. You can’t get any more simple than using one singe microphone to capture an entire drum kit. Aside from the fact that it’s extremely fast and extremely simple to set up, the other benefit of this approach to recording drums is that it does not hog all your microphones and cables, freeing these resources up for the rest of the band when you’re tracking live. Most your time in this setup will be spent moving the mic around to find the most balanced and even sound. You want to make sure that the cymbals and snare don’t drown out the kick drum, or vise versa. 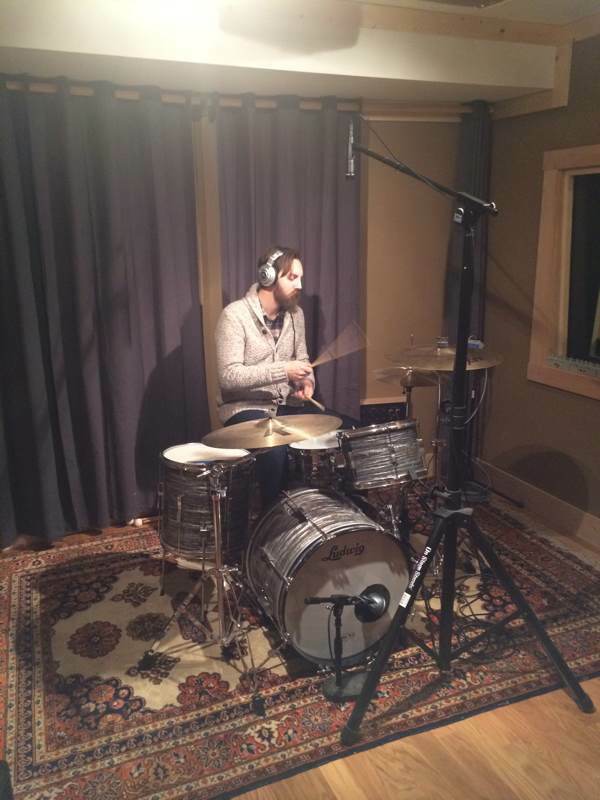 There’s two main options for using one mic to capture a drum kit – directly overhead, or directly in front of the kit. When trying the single overhead option, start out with the mic positioned so that it’s about 4 to 6 feet over the kit, and pointing straight down at the snare. This placement will emphasize the balance of the snare in the drum image a bit more. 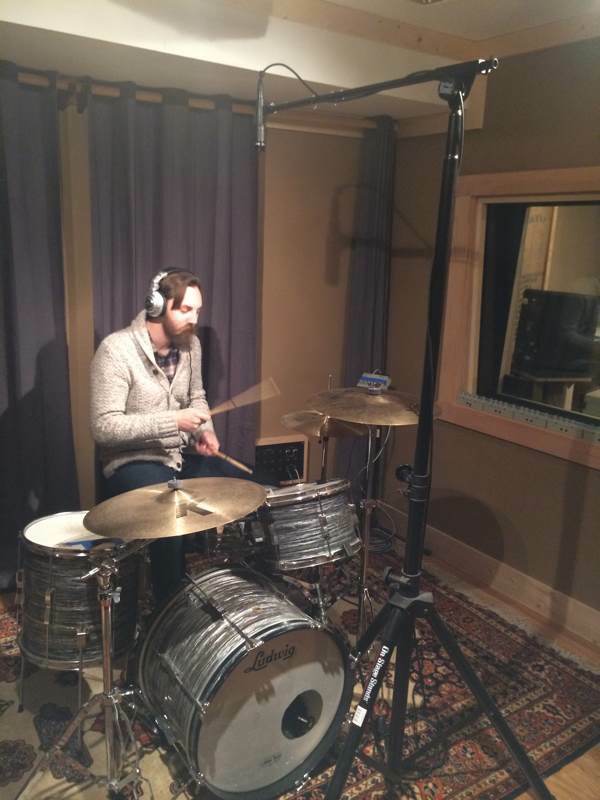 When trying the single mic in front of the drums, start out by placing your microphone 8 to 12 inches in front of the kit and so that the diaphragm is just over the top of the kick drum (about 12 inches or so from the floor). The mic should be pointed so that it’s “looking” at the empty space between the top of the kick drum and the rack tom(s). Have someone play while you listen to the balance of the whole kit. If one element of the kit seems to overpower another, adjust the position of the mic to compensate. It may be necessary to move the mic closer to the kit to get a more defined sound, or a bit further back to get a more dynamically consistent and balanced sound. In the end, you might end up putting the mic in a position that seems totally counter-intuitive. Don’t be afraid to just go with it if positioning the microphone off in some obscure corner ends up sounding awesome. Often enough, using just one mic to record your drums is too limiting. The main challenge I find is getting the kick drum to be audible enough once the other instruments are in the picture. If you find yourself struggling to get a good balance of the whole kit with just one mic, try using a dedicated mic for the kick drum, and then a second mic for the rest of the kit. When miking the kick, I usually go for two main positions – just inside the porthole of the front head, or all the way inside the kick about 3 to 6 inches from the beater head. Within these two positions, I’ll spend a little time fine tuning the placement of the mic to dial in the exact sound. The second mic you will use to capture the rest of the kit. 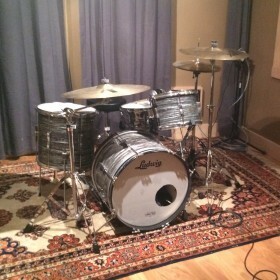 There’s three main options here: 1) as a traditional overhead mic positioned about 5 to 6 feet over the kit “looking” at the snare drum, 2) about 1 to 3 feet in front of and over the kit, between the rack tom(s) and ride, and “looking at the snare drum, 3) as a room mic somewhere in the room – 6 feet in front of the kit, behind the drummer, or some other completely unexpected place. Again, these positions are just starting points. To find the best sound for your specific situation, you will need to have someone play the whole kit while you listen and make adjustments. Find the position that feels most balanced and full in tone. When dialing it all in, try listening with both the kick drum mic muted and un-muted in your DAW. “Simple always wins” is one of the rules that I live by daily. In my world it’s a key method of thinking to keep a productive momentum. There’s always a way to simplify. 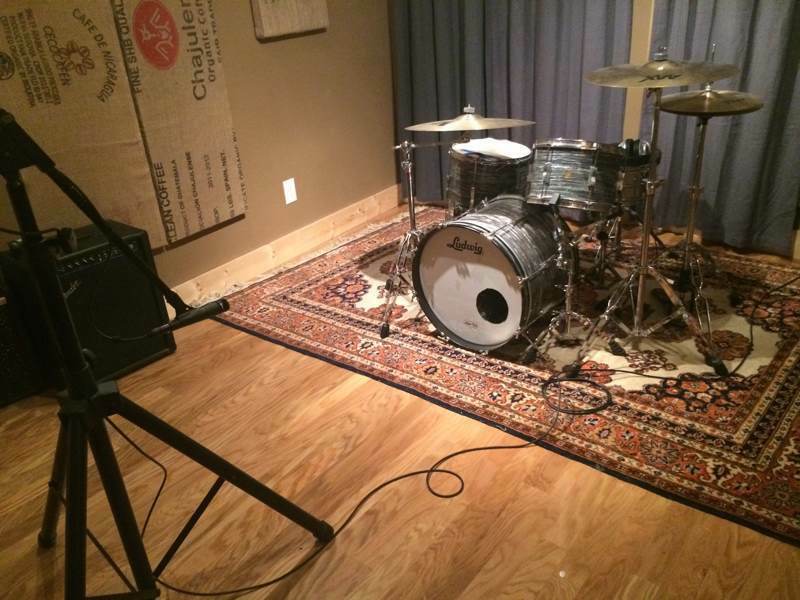 These basic drum recording setups are easy to put together, quick to get going, and yield great sounding results. I think you will be surprised how versatile they can be as well.